By road: Lundskullen is located off of the E20 motorway approximately 5km north of Vårgårda. Unfortunately there is no public transport near Lundskullen. For those visiting by car there is a signpost marked “Gravfält” that indicates the route to a small car park on the eastern edge of the hill. Lundskullen, along with its standing stones, lies on the west bank of the River Nossan, and is easily visible from the E20 motorway. Here can be a found a large number of Iron Age graves as well as two stone cists dating from late Stone Age around 2000 BC. 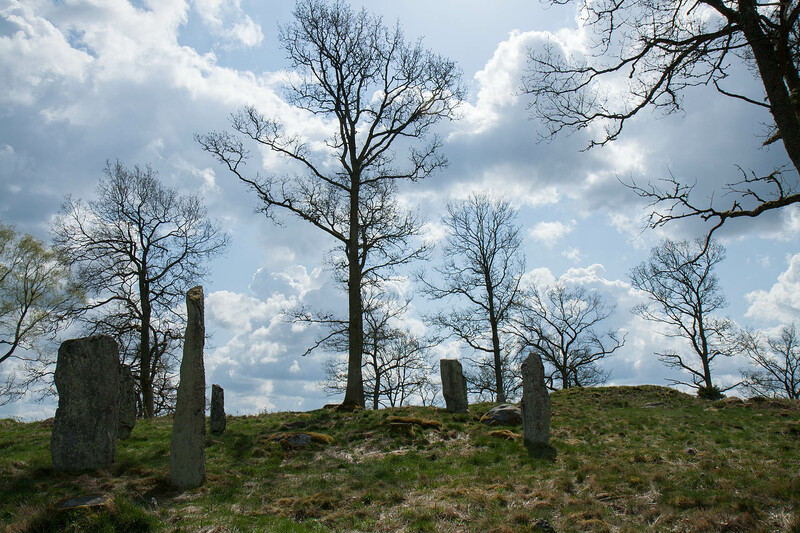 A kilometre to the north lies Jättakullen, where Sweden’s largest stone cist is located. There are several other Iron Age burial sites in the vicinity, underlining the area’s importance during the Iron Age. Lundskullen is situated in Södra Härene parish. According to the Swedish Place Name Dictionary the suffix in Härene means pasture or meadow. It is easy to conceive that regular flooding of the Nossan created excellent conditions for grazing. It is suggested that the prefix in Härene may mean stony ground, or alternatively hare. The distance to the River Säveån, with its inlet into the River Göta Älv in Gothenburg is only six kilometres. The Nossan runs out into Lake Vänern just above Grästorp. There were riding tracks passing Södra Härene and nearby a ford where the Nossan could be crossed. In other words, the location was very suitable for the local Iron Age farmers, with good communication links to both the Western Sea and north towards Lake Vänern. During an adjustment of the water levels in the river between 1893-1896 large wooden wheels, spurs, stirrups as well as swords, were found. One of the swords is now on display at Gothenburg City Museum. The sword is of a type that came into use from around 700 AD. At Södra Härene Local History Society’s website you can read about the Iron Age, Bronze Age, Stone Age and a great deal more information on the area (in Swedish): Sockenhistoria. The name Lundskullen implies that at that time there was a copse here. Or could it have been a term for a holy place where sacrificial ceremonies were carried out. The 40 standing stones are mainly located on the northern side of the hill and are visible from both the river and the motorway. South east of the standing stones is a stone ring and a little way to the south a three-point stone grave. Both of these graves are partially overgrown and are therefore hard to spot. At the top of the hill lies the largest burial mound. There are a further three mounds nearby as well as eighteen stone settings a little further to the south. All of these types of grave are typical of the earlier, pre-Christian Iron Age in Götaland. It is typical of the Vendel and Viking periods that graves were often built on existing graves from the late Iron Age or Bronze Age. Examples of this have been found in Vittene (T.Artlelius, M.Lindqvist; Döda Minnen (Dead Memories), 2007). During the early Bronze Age burial mounds were often placed at the highest points. It would therefore be reasonable to speculate that the largest mound on Lundskullen is an late Iron Age grave built over a Bronze Age grave. Within an area on the southern part of the hill are a number of large pits. According to hearsay, potatoes were grown in these during the early 1900s. There is therefore not necessarily any reason to think that these are burial remains. During a period from around 300 BC until 100 AD people often buried their dead in urns placed in pits in the ground. It is possible that an excavation could unearth graves such as this here. A large stone cist lies on the south west part of the hill. This dates back to late Stone Age, from around 2000 BC. The roof slabs are missing and the grave has been damaged by gravel collection during the 1800s. Before it was damaged the grave was completely covered with earth an in all probability looked like just a mound. Yet another stone cist can be found in a garden south west of the hill. There is a concentration of stone cists along the course of the Nossan’s valley. These were used by the farmers of that time as family graves. Flint daggers are a common find in stone cists and, in rare cases, even bronze objects have been discovered. We find graves on Lundskullen covering a very long period of time, from around 2000 BC up until Viking times. The burial site may, however, have fallen out of use for hundreds of years before being returned to use at a later date. At present that is something we know very little about.